Whether you need a prime, continuous or standby generator, Ohio CAT is committed to providing you clean, reliable power. Each Cat diesel generator set is engineered and designed for optimal performance. Why Buy a Cat Diesel Generator? Caterpillar Diesel Gensets are reliable, rugged and built to meet world-class standards. They are highly efficient and meet global emission standards. When you purchase a Cat prime, continuous or standby generator, you can rest assured that you will have clean, economical power at your industrial or commercial establishment. All major components are tested individually; and once the generator set is assembled, the complete unit is tested at and above 100% of rated load for operation and safety. Whether you need backup power for a hospital, data center, agricultural application or mining site, choosing Cat Power sets offer a huge advantage over all other brands. Each diesel generator comes with the support and service of our many locations all throughout the state. Ohio CAT’s experienced team is here to support you, starting with the delivery and continuing throughout the life of your diesel genset. Ohio CAT offers the largest range of diesel generators specifications available. Cat gensets deliver the power you require along with low fuel consumption and reduced long-term operating costs. No matter the type of application, power requirements or regulatory environment, our experienced team will help you find the diesel generator for sale you need in stock. 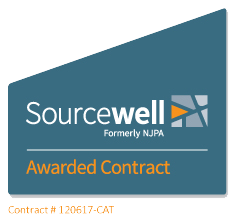 Caterpillar proudly supports the Sourcewell Contract #120617-CAT. Discover a purchasing path that offers quality products, service and support. Caterpillar is proud to be a Sourcewell vendor and is excited about the opportunity to provide members with power solutions. When working with Ohio CAT, Sourcewell members can select from a range of diesel and natural gas CAT generators from 40kW – 4000kW to meet your specific needs. You’ll also get the unmatched product support and service you can expect from Ohio CAT. Contract #120617-CAT is offering Free 4 Year Extended Service Coverage on qualifying Diesel and Natural Gas Generators. As a member of Sourcewell, you’ll. . . Remove time and expense of purchasing process by using a nationally bid contract. Work directly with Ohio CAT to meet your needs. Not an Sourcewell Member? Join for free by visiting Sourcewell Become a Member.